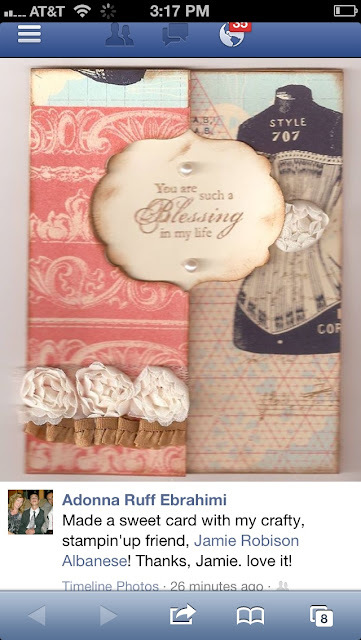 Feature a beautiful card, Yes please..
At a Recent Event a dear friend and fellow crafter, Adonna, created this beautiful swing card. A true romantic, she's the princess in a castle (she has two sons and a strappin' hubby - she's a real queen in her home and lives in what looks a little like a castle). Knowing her is such a blessing and the moment she came I couldn't resist showing her the new Thinlits and the Etcetera Designer Series Paper (#130129). She was beyond excited to play with them. Her Results really wow, don't they? She quickly fell in love with this stunning paper and Baked Brown Sugar ink/color (#131174). The stunning coordinated Ruffled Ribbon (#130022) allows for an uber girly touch! Vintage, Classic, Elegant.. that surmises my friend. These Retired (I was so sad to see them go!!) 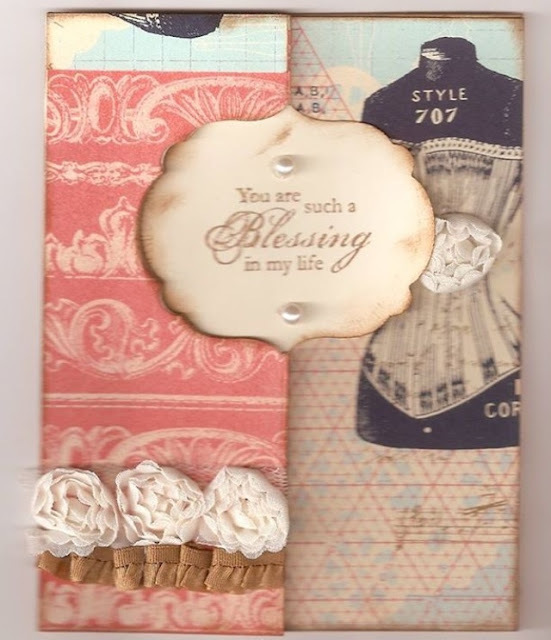 from the Occasions Catalog Flower Trim adds the perfect vintage element to this moving card! She featured it on her Facebook page... awww - don't you love it when style is noted?? Hers is uber elegant and classic. This MOVING Card is easier than ever to create and is sure to WOW! I'm sooo looking forward to herrrr Private Class!! Join Her - Host Your OWN Private Class and Craft Some FUN!! Isn't her style all that?!?! Sharing other's creations is such a fun way to celebrate one another! Raise a glass to her style and results! How do YOU Share Your Accomplishments? Leave me a comment and let me know. Share THIS on Pinterest, Facebook, Twitter, Email and more! Join ME with a Follow on those Channels and YouTube, InstaGram, LinkedIn and more!